Chambois is a commune in north-western France. It is in the Orne department. 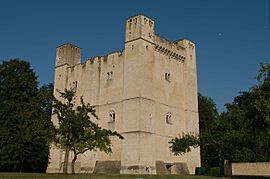 The Donjon of Chambois is a small castle, or keep located on the road from Exmes to Falaise. It was built in the second part of 12th century, by William de Mandeville, vassal of Henri Plantagenêt. The height of the rectangular structure is about 26 metres. It was framed by an extension in the southeast angle and by rectangular turrets in every corner. The central volume contained three levels of rooms, each of them with windows, a chimney and, in the angled turrets, annexes. These arrangements illustrated the residential function of the Donjon. Chambois Facts for Kids. Kiddle Encyclopedia.